Why Have an Aluminium Fence? Aluminium fencing is an affordable option to display class and flair without sacrificing any durability. Aluminium fences come in many shapes and forms, making it a versatile choice with a broad scope of styles and colours so you’ll end up with exactly what you want. But before you dive into installing an aluminium fence, here are some tips to make sure everything runs smoothly. Giving Dial Before You Dig a call is an absolute essential before breaking any ground. Because fence posts have to go in deep enough to potentially hit pipes and cables, not making the call to dial before you dig could end up costing you serious dollars in un-anticipated repairs. Not to mention the inconvenience of a burst pipe or severed cable to your home or business. All you have to do is tell Dial Before You Dig where and when you plan to dig. They’ll relay that information on to the underground utility owners, who will let you know where the cable and pipes under your home are. You need to be aware that different areas can have different rules that relate to height and boundary requirements. For instance some locations will allow for fencing to go directly along the property line, whereas others might require an offset. Having a survey done to clearly identify your property lines is a sure way to avoid any issues that could cause problems. Issues range from accidentally building your fence across an easement to accidentally encroaching on a neighbours property who might be unaware at the time you build your fence, but be within their rights to make you move it when they eventually find out you have a few feet of their land! 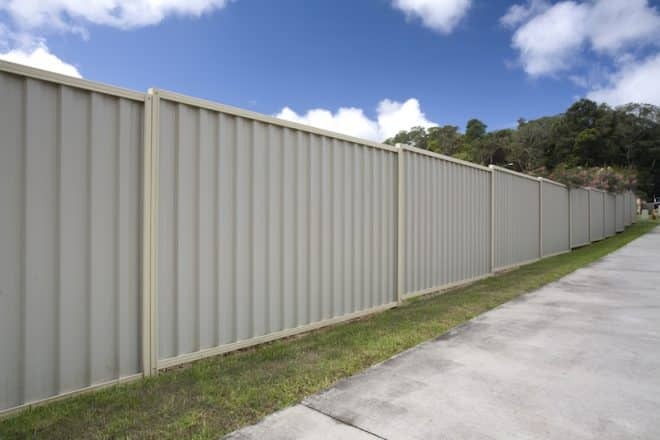 With a few wooden stakes at the corners and a piece of string running between them you can easily get an idea of the lay-out your aluminium fence will take on. This might seem trivial, but it is much easier to manoeuvre stakes and string around problematic rocks, trees and uneven ground than running into the same problems for the first time with a heavy fence post in hand. After measuring your spacing and removing your stakes, use paint or spray paint to mark the exact centre spot where the posts will be installed. Keep in mind that different posts have different purposes, some are corners, some are ends and some are gateposts. Be careful not to mix and match your posts as it can make for expensive and frustrating re-working of your aluminium fence layout. Always start with your gateposts. With a wooden fence there is a lot of room for alterations and adjustments as you go. However aluminium fencing has done a lot of the fitting work for you before it’s purchased. Aluminium fencing often comes with pre-punched rails and posts that fit neatly into each other which can save time and effort, but only if your measuring is spot on. Starting with the gateposts and working outwards is the best way to avoid future alterations and impractical gate locations. Because they have to support the gate, Gateposts have a much heavier weight burden than other aluminium fence posts. It follows that gatepost holes should be the deepest that you dig when installing your aluminium fence. Digging a hole for your gateposts that is similar in depth to the other fence posts often leads to having to re-dig and re-secure the gateposts down the track. However if it is put in deep enough to begin with there won’t be an issue. Without properly anchoring your fence posts, you leave them vulnerable to gradual sagging and weakening. The simplest way to install an aluminium fence post to a concrete surface is to use a floor flange to bolt it down to the concrete then insert and make the fence post secure. Stay patient! Make sure your concrete has fully dried before going ahead with your installation. It can take around three days for the concrete to dry properly, but waiting it out is better than ending up with a shaky fence that will take much longer than three days to fix. Without proper preparation installing an aluminium fence can become a far more costly and time-consuming process than it needs to be. But with these tips in mind you should be able to avoid the potential snags and make the installation go as swimmingly as it should. If all this still seems a bit daunting then give the aluminium-fencing experts at Everlast a call today. We’re always available and happy to come over, flag some issues and provide a free, no obligation quote for you.